A restored Cold War bomber is taking to the skies for a series of test flights over the East Midlands. 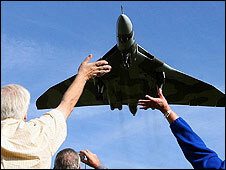 The Vulcan bomber was restored at Bruntingthorpe air field in Leicestershire using public donations. Organisers from the Vulcan to the Sky Project said the flights at RAF Cottesmore in Rutland would take place on Monday afternoon and Wednesday. Project manager Andrew Edmundson said: "We will carry out a series of avionics tests at the RAF station and then return (to Bruntingthorpe) tomorrow. "This is all dependent on the weather. If the weather is suitable for our tests we will go ahead." Mr Edmundson said: "The plane is ready and more than 30 people are waiting to get it on the runway."